→How to Look Stylish in Disney Wedding Dresses? How to Look Stylish in Disney Wedding Dresses? 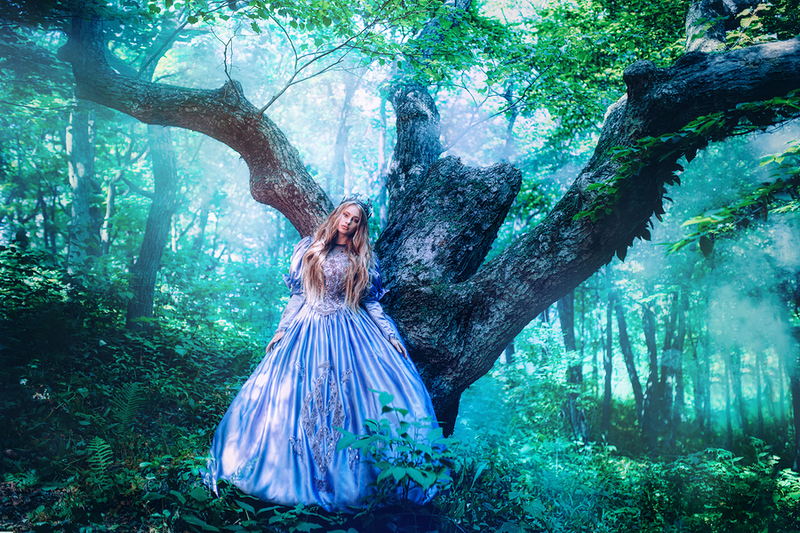 Have you ever dreamt about becoming a princess? In everyday life, this dream is hardly achievable unless you were born in the royal family or your husband is a prince. However, the dreams may come true at your wedding day. A wedding is a real chance to become a princess from Disney cartoons for, at least, one day. Disney wedding dresses aren’t very widespread, but they are unforgettable. Moreover, there is no need to copy the dress design of Cinderella or Belle. You may just take some elements from their dresses and make your wedding gown look more modern. Want to know how to be a stylish princess? Then, let’s go. Clearly, though all of us dream about being princesses in childhood, not every girl makes up her mind to wear a Cinderella or Belle wedding dress. 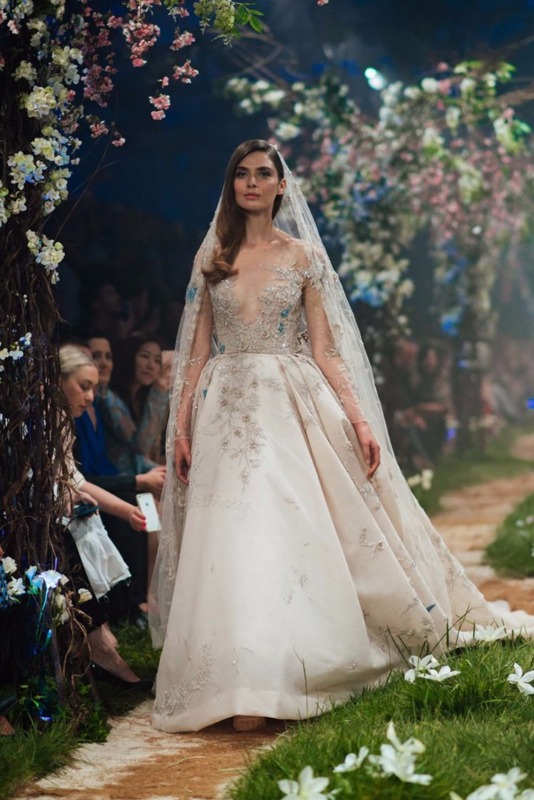 If you can’t decide if to opt for a fairytale gown or not, here are the reasons to do that. 1. You may think that a dress, inspired by the design of a Disney princess' gown, may look a bit weird. Actually, it’s true. But no one asks you to make the exact copy of the dress you like. You may take the elements you like the most and add them to your gown design. For example, if you like off-the-shoulder neckline of Disney Belle wedding dress, you may do something similar but on a more modern gown silhouette. 2. The Disney-inspired gowns may look very stylish. Some wedding designers even create Disney wedding dress collection. 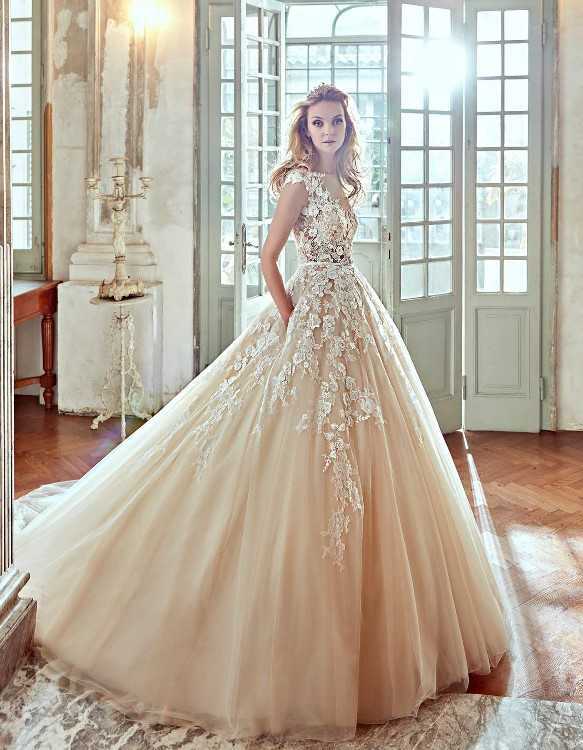 For instance, you may find Alfred Angelo Disney wedding dresses or the ones by Paolo Sebastian. The designers don’t create copies, but just draw inspiration from Disney cartoons. 3. It’s not obligatory to have princess ball gown wedding dresses. The gowns may be of all possible silhouettes. Thus, mermaid gowns may be inspired by Ariel while A-line ones by Elsa. 4. Princess wedding dresses are a good chance to fulfill your childhood dreams and become a princess for one day. 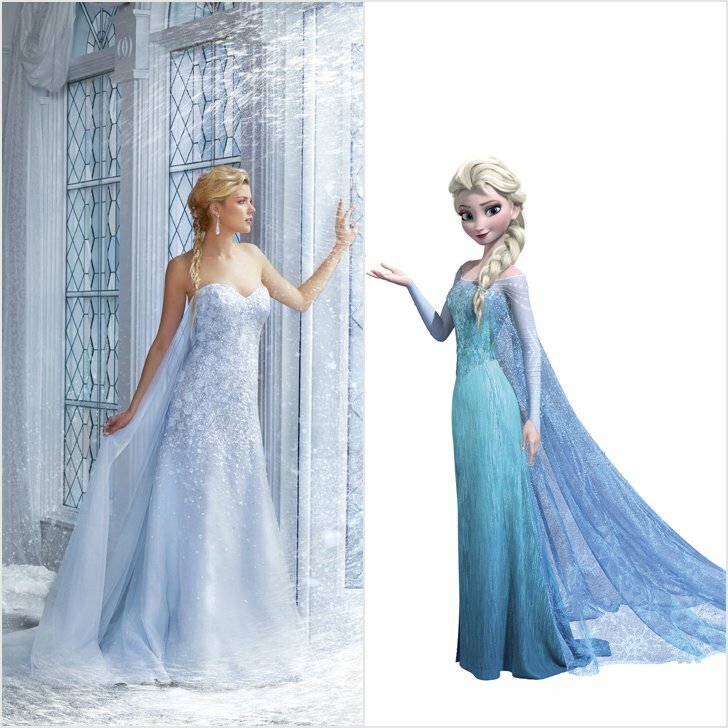 As Disney gowns may be in different silhouettes, you will surely find the proper one for your body type. And so, every girl may allow herself to be a princess. 5. Finally, you don’t have to wear a colorful wedding dress as usually princesses have. Even if Belle wore a gold-yellow dress, you may have something similar but in traditional shades of white as well as in any other color, which suits you. Cinderella: Disney Cinderella wedding dress may take such details as a big skirt and shoulder details from the personage's outfit. Snow White: Snow White wore a dress of tea-length and today, this dress length is pretty popular. Moreover, the puffed sleeves may be also used for creating a fairytale bridal look. Rapunzel: Rapunzel may inspire you to have a lilac wedding dress. Also, the personage wore a dress with sleeves, which may also be a great addition to your wedding gown. Belle: Belle’s gown is a wonderful example of off-the-shoulder neckline, which is trendy now. A good idea is to have a gathered skirt, though it can be designed in a more modern way. Also, Belle may inspire for having a dress with gold elements, which will make the dress looking very luxurious. Ariel: Ariel may push you forward for having a mermaid wedding dress. If you have beautiful body curves, you can definitely wearing a gown of such a silhouette. Elsa: Elsa may also provide you with a couple of tricks. Her dress was sparkling and it’s surely a perfect feature of a princess wedding gown. Also, she had a cape, which is an astonishing and interesting detail, which can be taken off as soon as you are tired of wearing it. Tiana: Tianna may help you to consider green hues for your wedding gown. Also, her skirt design, which resembles a lily, may be used for interesting dress detailing. And don’t forget about flowery details. 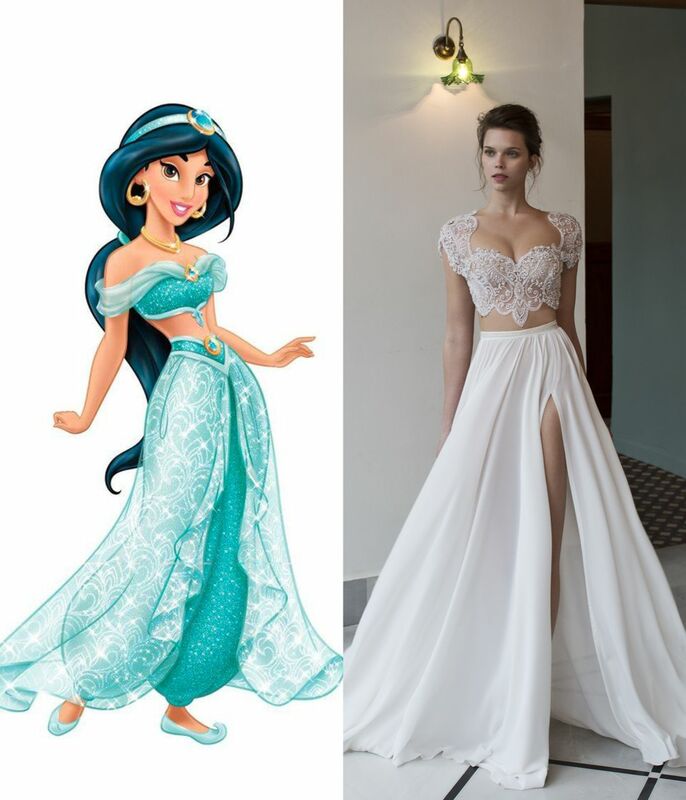 Jasmine: Jasmine’s gowns follow all the modern trends. First of all, she may inspire you for wearing a two-piece wedding gown as well as the one with open shoulders. Also, the princess shows you that you are free to wear a pantsuit instead of a traditional wedding gown. Aurora: Aurora’s dresses were blue and pink. And it’s a wonderful motivator for you if you think about non-traditional colors for a wedding dress. Moreover, her dress had long sleeves, which are loved by many brides today. 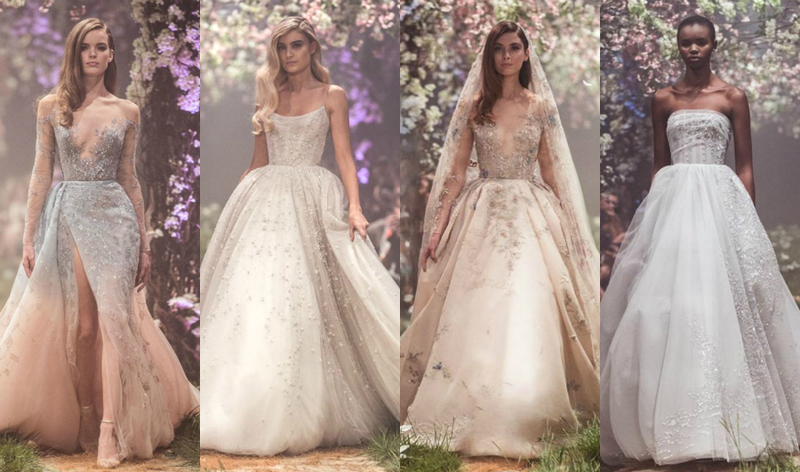 In order to prove that Disney princess bridal dresses can be very beautiful, modern and stylish, we offer you to have a look at 5 inspiring ideas. Should a princess sparkle? Definitely yes if she wants to. Disney fairytale wedding dresses look astonishing if some sparkling details are present. For instance, the gown can be adorned with sequins or crystals. But you can even go further and have a dress, made of sparkling fabrics. The additional effect can be added if the dress is of a glowing color like gold or silver. What about mixing fairytale with sexiness? Illusion wedding dresses are at the peak of popularity. And we are sure that you can combine an illusion bodice with the princess style. However, don’t forget to add some sparkling elements to make the gown look chic. One more trend in wedding dress design is off-the-shoulder neckline. And do you remember the gowns of Belle and Jasmine with open shoulders? 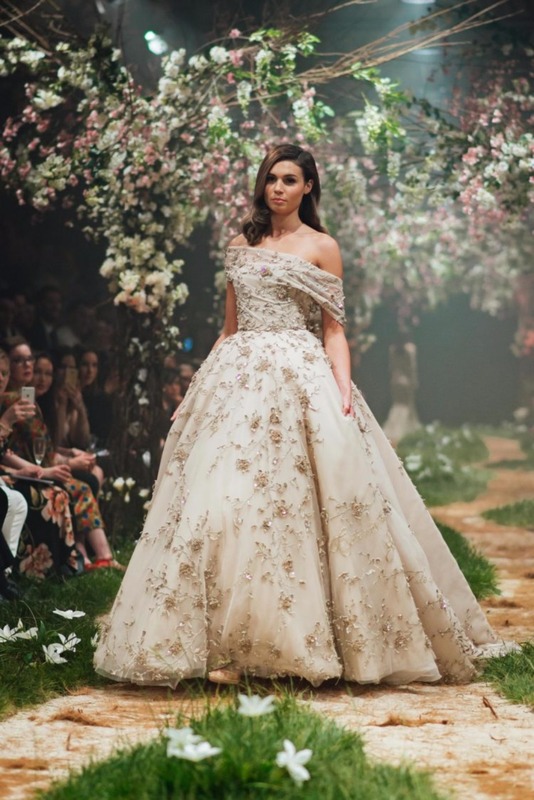 So, this time, the trend and the fairytale dresses have much in common and so, you may look really astonishing and princess-like in a wedding gown with off-the-shoulder neckline. Also, Disney wedding gowns may look very feminine and romantic with 3D details. Flowers, petals and butterflies are often chosen as accent details for wedding gowns. They can be located on the bodice, skirt or even cover the whole dress. Undoubtedly, blush wedding dresses remain favorites of modern brides for already a couple of seasons. And as all princesses wear colorful dresses, you have a chance to be a princess in a bridal dress of blush color. If you choose a blush bridal gown, it’s better to stick to traditional silhouettes like ball gown and A-line in order to look like a girl from a fairytale. In a nutshell, you see that Disney style wedding dresses are much more luxurious than the gowns we see in cartoons. Modern wedding designers get inspired by cartoons and create real masterpieces, which look like the gowns from fairytales, but, at the same time, are very stylish.